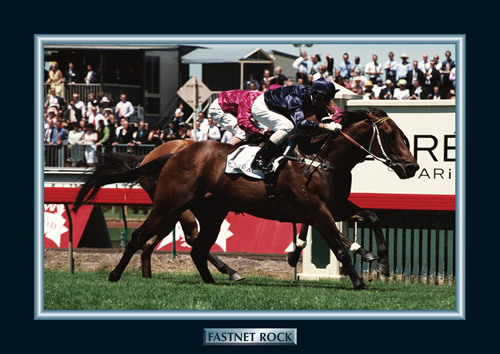 Fastnet Rock beat almost everything in it's path over a sprinting distance on it’s day. Famous for it’s contest against Lee Freedman’s flyer Alinghi in which he went on to run a gallant second but in so doing went down to a true Sprinting Champion of the turf in Alinghi and running second was no disgrace. Going into that race he had every right to claim close favouritism as he had already claimed two group ones. His racing highlights included Group One wins in the VRC Lightning Stks and the VATC Oakleigh Plate. Not to mention Fastnet Rock being named Champion Australian Sprinter of the 2004/05 season.